The prospect of owning a talking bird is an exciting one, but many people fear that they could never have such a pet due to lack of space or other issues that prevent them from adopting a large parrot. If this sounds like you, then you are in luck -- there are several smaller to medium sized bird species that can talk just as well as any large parrot can! Browse the information below for profiles, photos, and more information on these talented birds. Odds are that you'll be able to find a feathered friend that will be a good fit for your family. 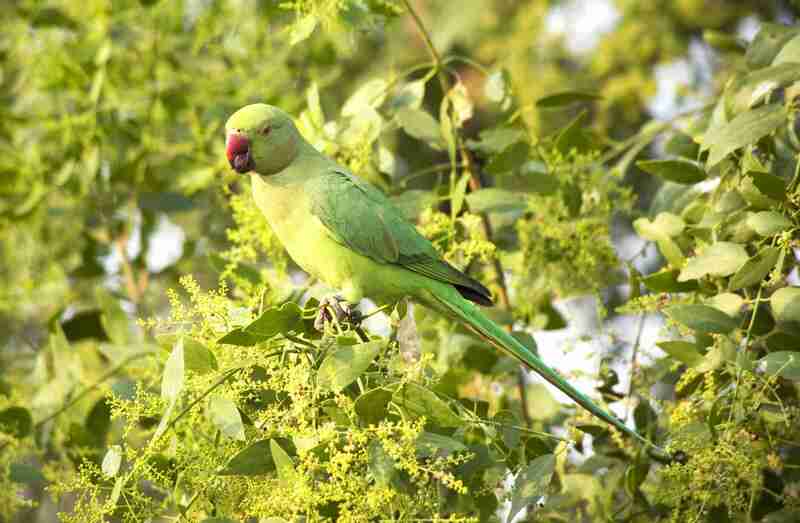 Those who are looking to adopt a real chatterbox might consider acquiring a Quaker Parrot. These comical little birds are known for their feisty personalities and clear, high-quality speech. Quakers in an array of color mutations are becoming widely available to bird owners through specialized breeding programs. If you are interested in a Quaker Parrot, however, be sure to check your local laws before bringing one home -- because these birds are so hardy and can thrive in surprisingly harsh conditions, they are illegal to own as pets in some states, as they can pose a threat to native wildlife if they escape. Popular as pets among young people and "beginner" bird owners of all ages, Cockatiels can also learn to speak a word or two. While they are reported to not be as chatty as some other species, it's worth noting that many of them make up for it with mimicking household noises such as telephone ringers, microwaves, doorbells, and alarm clocks. Most Cockatiels are also accomplished whistlers, with many learning to whistle complete tunes. If you'd like to encourage your Cockatiel to speak more actual words, it is important to establish a consistent training schedule and limit your bird's exposure to unwanted noises and sounds. Another good option for those who want a small or medium-sized talking bird would be one of the beautiful Conure species. Most Conures only learn a few words, but some can go on to build fairly large vocabularies for a bird of their size. Like other species such as Cockatiels, many Conures seem to prefer to mimic repetitive sounds like beeping alarms rather than human speech, but this can normally be modified by employing short, frequent training sessions that focus on the word or phrase that you'd like the bird to learn. One of the smallest, most popular, and easiest to care for parrot species is also hailed to be among the best talkers -- and this is the magnificent Budgie. These tiny yet infinitely intelligent little birds are capable of learning literally hundreds of individual words -- far more than some birds who are two to three times their size. It can take some time to get a Budgie to start talking, but patient and consistent owners are often rewarded with birds whose vocabularies rival even some of the most talented talking parrots. Budgies are an excellent choice for those who would like to have the experience of owning a talking bird without having to go to the trouble and expense of caring for a larger parrot.